This is one of my favorite places on earth. It's a place of peace and holiness for me. When I attend I am able to put all of the things of the world out of my mind and focus on the things of eternity. 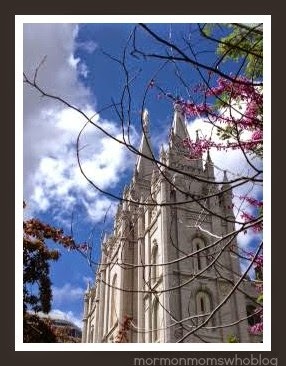 A few weeks ago I felt prompted to go up to the Temple in Salt Lake City, Utah. So, I readied myself and went in the spirit of fasting and prayer. I was seeking answers from the Lord concerning certain challenges in my life. We all have them and often need the Lord's guidance to help us know what to do. His wisdom is much greater than our own and, I know for myself, He desires to help us. As I was entering into the gates I saw this beautiful scene and just had to take a photo. It's a magnificent structure, built by great sacrifice over a 40 year period, and the day was glorious. The pink blossoms agains the blue sky were breathtaking to me and...I stood in awe and reverence at the majesty of God and His creations. But, the power of the Temple is not in the walls or the fixtures, but, rather, in the beautiful covenants; for...we are a covenant keeping people just like in ancient times. And, we are promised glorious blessings as we keep those sacred covenants and strive to be made holy ourselves. He didn't send us here to this earth just to leave us alone. In fact, he told the early saints "I will NOT leave you comfortless." That scripture has helped me during many of my own trials where I needed and sought Him sincerely and, the Temple is one place to feel that for ourselves. His Spirit is there and it comforts and blesses us as we seek it and as we are worthy of it. I am grateful for the blessings of the Temple; a house of God, and encourage all to worthy themselves to be able to go there. It is of the holiest places on earth, a place of instruction, peace, and understanding.